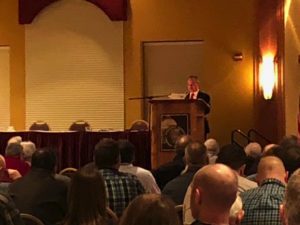 The 2019 WCHA Winter Road School kicked off Monday, January 14 and ran through Wednesday, January 16, with highway officials from across Wisconsin and WCHA associate members meeting at the Chula Vista Resort in Wisconsin Dells. Highway commissioners/public works directors, office managers, committee members, state officials, corporate sponsors all participated in the event. Speakers at the Winter Road School included industry experts and legislative leaders. On Tuesday, January 15, new Wisconsin Department of Transportation (WisDOT) Secretary Craig Thompson spoke to the group. See photos from the 2019 WCHA Winter Road School here. View all handouts from the 2019 Winter Road school here.